Import Products Into an Order from a CSV File – How can we help? You can import products (including supply price and quantity) to a new or saved order from a CSV file. This is an excellent way to quickly create a large purchase order, such as from a data file created by a handheld inventory scanner. Handle [Optional field] - the product handle (must match an existing product in Vend). SKU [Mandatory field] - the product SKU (must match an existing product in Vend). Supply price [Optional field] - the per-item supply price. Quantity [Mandatory field] - the quantity of each item ordered. If you have selected a supplier for your order, all the products imported must have the same supplier as the supplier selected. 1. 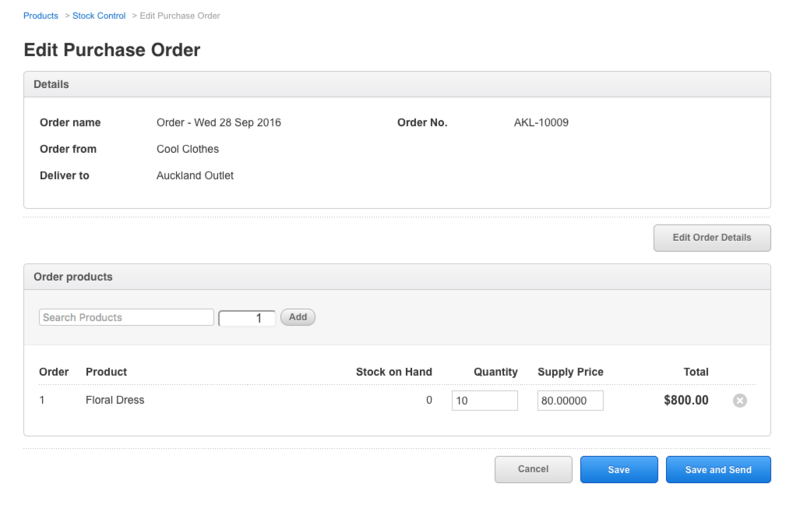 Create a purchase order or a stock transfer. 2. Under Order from, choose the supplier (or leave as Any). 3. Select an outlet for the order to be Delivered to. 4. Under Import Order select Choose file and upload your saved CSV file. To import items in a CSV file to an existing supplier order or stock transfer: Select a previously saved order or stock transfer, from the main 'Stock Control' tab. On the next screen is an 'Import' button. Click this and follow the steps to import products to the order. 6. Once you have received all the items in your order, select Save and Receive. My stock order has only let me receive in one page, but there are over 1000 products left in my order? Follow the steps as normal on how to receive a stock order. Once you have received your first page of products, you will notice that only 499 products have been received. Select Receive at the top of the screen of the same order to receive the next page. Note: When you select to Receive your next set of items, only unreceived items will be received. You will not be able to receive items that have already been received previously in the current order you are processing. Once you have received all the remaining products left in your order, you will no longer be able to select Receive. This signals that you have received all the products in your order. Head to your Stock Order page to see all the products received in the order. What happens if I add a product that is not from the supplier selected in my order? If you include a product that's from an incorrect supplier, when we import your CSV file, we will delete this item. What happens if I add a product but don't tell you what the supply price is? If you don't specify a supply price for an order, we will use the supply price on the product page for that product. What happens if I add a product and tell you the supply price is different from the supply price on the product page? The product will be added to your order, and the supply price you tell us will be used for that order. Don't worry, this doesn't change the price on your product page - just for this order and will be used for reporting later on. What happens if I add the same product twice to my CSV file with a different supply price? We'll assume you're getting it at two different supply price levels, and add it as two different items to your order at each supply price. What happens if I add the same product twice to my CSV file with the same supply price? We'll assume you made a mistake and add all the quantities together, so you only have the product listed once. Note: It is not possible to import items to an order after it has been marked as Sent.